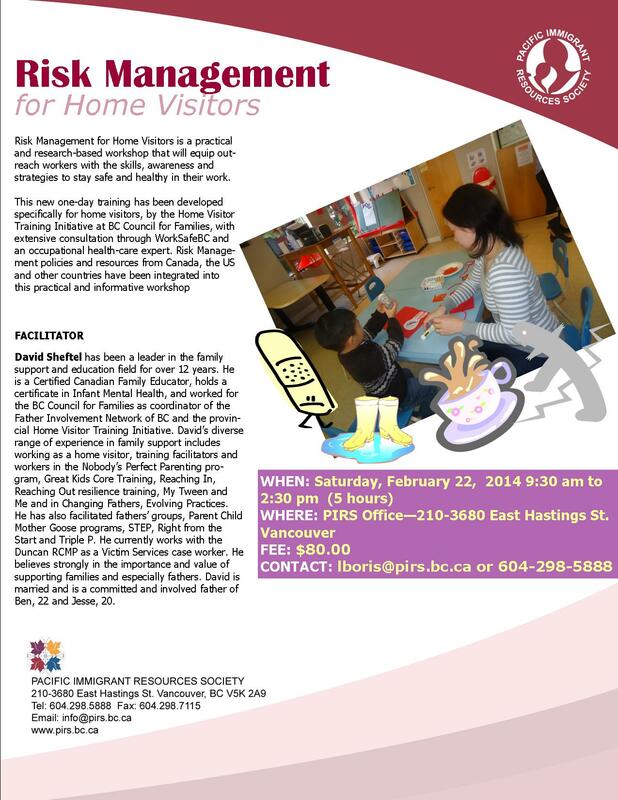 Risk Management for Home Visitors – Coming Up Soon! Sign up for an important training session coming next week. Certified Canadian Family Educator, David Sheftel, will be sharing his knowledge in a session titled Risk Management for Home Visitors. See poster below for more information. For those interested, complete this form and send to Lupita Boris (lboris@pirs.bc.ca) or fax to 604-298-7115. This entry was posted in News & Events by pirs. Bookmark the permalink. I am interested in being on the email list for the monthly Women’s meetings. © 2019 Pacific Immigrant Resources Society. All Rights Reserved.